What a show stopper! The Nunn Finer Ingrid Dressage Bridle has an elegantly shaped Swarovski crystal browband and a striking extra wide padded noseband! 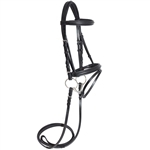 You are sure to turn some heads in the Dressage ring with this bridle. This flat hook end bridle is crafted with exceptional Italian Leather to ensure this Dressage bridle will retain its luster and yet still be durable. Featuring an extremely soft, padded crown along with a padded crank cavesson. Complete with rubber lined reins with hand stops. What a show stopping bridle from its elegantly shaped Swarovski crystal browband to its striking extra wide padded noseband! 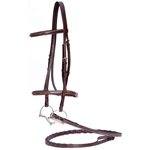 You are sure to turn some heads in the show ring with this bridle. This flat hook end bridle is crafted with exceptional Italian Leather to ensure this bridle will retain its luster and yet still be durable. Featuring an extremely soft, padded crown along with a padded crank cavesson. Complete with rubber lined reins with hand stops.